Excerpts from pigeon loft, installation site #1 documentation. 2018. What is happening here? [exploits of the nonhuman] aims to create a critical and practical methodology allowing for the production and reception of anthrodecentric art, to provide viewers the opportunity to acknowledge the existence of nonhuman agency, to recognise these agencies, and to establish common language in order to discuss nonhuman agencies as revealed. To engage with this type of encounter is look, see, and be with another. The creation of anthrodecentric art follows this process: 1 - the use of non-Cartesian modes of representation to open the possibilities of 2 - enabling a state of re-enchantment, which then allows for 3- the visibility of nonhuman agency. To understand re-enchantment is to be open to understanding relations between Things outside of the human dominated hierarchy of Cartesian thinking. This is not a magically-orientated thinking, but a thinking grounded in looking, seeing and understanding a shared reality. The call for re-enchantment is to call for an understanding of the ‘lives’ of things. For example, the lives of inanimate things after becoming rubbish — how a plastic water bottle becomes a floating island of trash in the Pacific Ocean that is larger than the state of Texas. Now, to look, see, and be with the pigeon . . . The first two central terms here are most likely self-evident, human and art. Humans are the producers and consumers of art — art is a critical reflection on the life and times of the producing humans and serves as a form of historical record. The third term, pigeon, may seem more contestable. This work is being generated under the auspices of anthrodecentric art, as such the pigeon is the present nonhuman within this body of work. The pigeon is the central being in this work due to their omnipresence in London and their radically varying relationships to humans historically. The human-pigeon ties of relation are long-standing, since Sumerian cultures the pigeon has been integral to the thriving of the human species. More recently, the pigeon was the starting point of contemporary mail systems and messenger pigeons were active serving members of the armed forces in World War II, able to carry out missions when humans were unfit and incapable. Given developments in mechanical and digital technologies, the techne of the pigeon/as animal has been erased of their use-value. This diagrammatic model affords the pigeon a use-value in contemporary London — their scavenging behaviours are recognised as a complementary function to the street cleaner as the pigeon performs as a bio-recycling system. Herein lies the intersection of pigeon/art/human, within the bio-recycling capacities of the pigeon, the functions of art as re-purposer and subsequently assigner of value, the human can consume this art work predicated on the active presence of the nonhuman, and their agency through the materials of the art work, which allows the rubbish produced by the human to be bio-recycled into the realm of value. The pigeon loft, is one example of anthrodecentric art, this work began with the building and installation of a functional pigeon loft onto the roof of the Slade last spring, the loft is still there and has been used in one installation of work last June. This work engages with multiple ecologies, such as University of College London and the local pest control, that of the gallery, of representation, of human and nonhuman relations, and the imaginary as relates to the fictive imaginary of Cartesian representation. Within the UCL ecology, not only does the loft offer a sphere of beneficence, but also functions as a constructive institutional critique, given the institution’s policies on eradicating the local pigeon population. This constructive critique functions by subverting the eradication policies and providing a site of sustenance and care. This may be read as an (un)intentional artistic practice — unintentional as the primary objective was the care of pigeons and intentional given its eventual translation into a gallery space and subsequent encounters with viewers. Presences, histories, and futures collide in these encounters and unleash multiple potentialities. As Donna Haraway states, “Once again we are in a knot of species coshing one another in layers of reciprocating complexity all the way down. Response and respect are possible only in those knots, with actual animals and people looking back at each other, sticky with all their muddled histories.” This particular encounter, the pigeon loft, does not allow for actual animals to look back at the viewer in the gallery, but the viewer will not have to wait long for this face to face encounter, re-engaging in being-with and enacting re-enchantment with the pigeon in London. Much like political ecology, art, does not shift attention away from the human pole, but can call into question the fixity of belief. 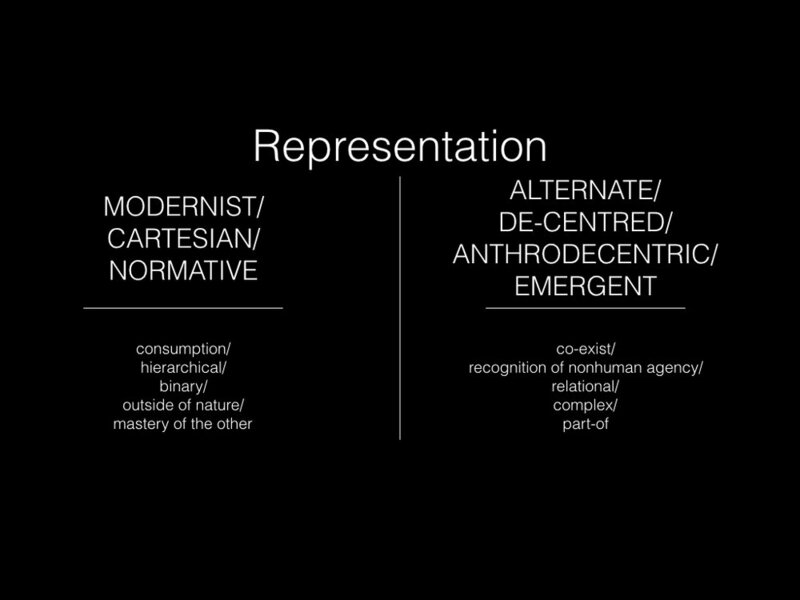 This conceptual movement, or becoming unfixed, is a key objective in anthrodecentric art, and is achieved through the use of non-Cartesian modes of representation. 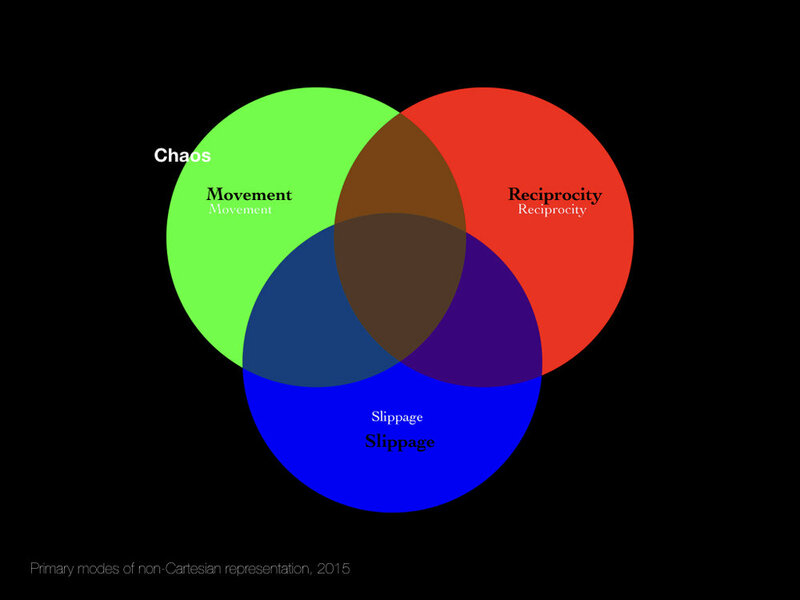 I am working with three primary modes of non-Cartesian representation: movement, reciprocity, and slippage. One element or method of movement is chaos. To ‘engender new fields of the possible’ is the ultimate objective of the work of anthrodecentric art, but all the potentialities cannot and will not be accounted for — the possible inversions will play themselves out through each encounter with each viewer and then move out through the world in translated perceptions completely outside of my authorial intention. At best, the diagram accounts for a potential, yet chaotic distribution of the encounter through the desirable ethical constructs which can arise from re-enchantment. From the inexhaustible diagonal, a continuous stream of chaotic movement disallows for this work to be exhausted or complete, but in a continuous state of discovery and generative confusion. Working within modes of non-Cartesian representation disallows using up, abusing, and taking as one’s own. The site of function is predicated upon the usefulness of the loft to pigeons. Although not dictated in the above diagram, this is also a function of spherical influence — assumed positive influence on a regional pigeon population. This population is brought into contact with this single site of care and protection, then this sculptural object is moved into the site of representation within the gallery. As the site of representation multiple viewers are able to come into contact both physically and conceptually — if the viewer moves from this site and continues to act as a sphere of translation, bringing this sense of care into the world they inhabit — a circle may be created, if their attitude towards pigeons may lead to a change in behaviour, becoming an actor of caring. Then we may have a reciprocal act between two single beings or two essences of being. To engage with this type of encounter is to engage with reciprocal looking, seeing and being. There is ample opportunity to read the work, the space, the people around oneself — it is not only humans who engage in such a practice. The opportunity for the animal to read the human is omnipresent, which is arguably why most animals are present, yet elusive — or perhaps remain in our peripheral vision. The ethics of anthrodecentric art do not depend on forcefully placing the animal in the visual sphere of the human, this would only reify the sense of human mastery. The task of anthrodecentric art is to aid the viewer in recognising what they have not yet seen; to other oneself, recognise the others in oneself and the multiplicity of entangled selves by which they can find themselves surrounded. John Berger states, “We never look at just one thing; we are always looking at the relation between things and ourselves. Our vision is continually active, continually moving, continually holding things in a circle around itself, constituting what is present to us as we are.”(6) Anthrodecentric art through enacting reciprocity expands our presence and allows us to become re-enchanted by the others and to understand the potentials of nonhuman agency. The active objects and things, alongside the theoretical objects, are allowed to slip in between states of knowing, understanding, and remain unfixed. This state of the theoretical object as unfixed continually pushes against the notion of stability. Stability is undesired. By rejecting stability the work moves the materials towards re-enchantment, this often revolves around both intentional and accidental concepts. The intentional concept is quite clearly what the producer has intended. The accidental concept is less identifiable and often emerges through each individual encounter with the theoretical object and brings the viewer fully present in the engagement. This then means that the knowledge that can be generated through the theoretical objects is inherently unfixed. There is the knowledge of the producer. The knowledge of each viewer, following each engagement. The work of anthrodecentric art and practice and is not producer centred, but on the new ways of thinking and perceiving that arise from each encounter. There is a constant slippage in each encounter with each individual theoretical object and the installation as a whole, in relation to systems theory, Francis Halsall states “This idea that it is impossible to relate every element to every other one except by virtue of their interconnectedness suggests that complexity is about the unity of system as a whole which is of greater conceptual significance than the sum of the parts.”(7) The whole of any work of anthrodecentric art is maintained through the slippage of elements and an individuals capacity to accept their knowledge and the limits thereof. In closing, a thought from Donna Haraway, “Never purely themselves, things are compound; they are made up of combinations of other things coordinated to magnify power, to make something happen, to engage the world, to risk fleshy acts of interpretation,”(8) here Haraway is explicating an important aspect of agency in the practice of anthrodecentric art. The human, the nonhuman, and the work of art are never solely themselves, but acting with one another, engaging and magnifying what is present. 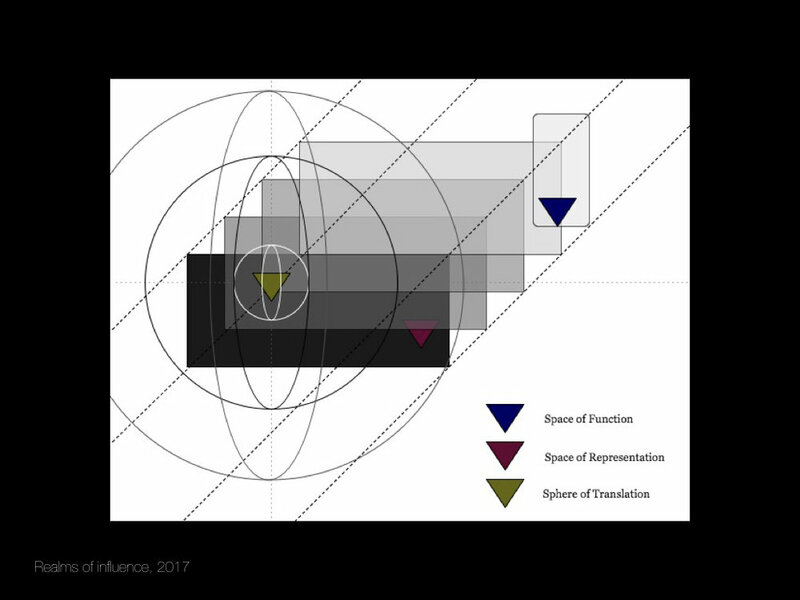 In short, the function of non-Cartesian representation results in the re-enchantment of the spheres of function, representation, and translation into the zone of enchantment; where the nonhuman agency is possibly visible. (1) Haraway, Donna J. When Species Meet. Vol. 3. Posthumanities. Minneapolis: University of Minnesota Press, 2008. p42. (2)Heidegger, M. The Question Concerning Technology and Other Essays. Translated by W. Lovitt. New York: Garland, 1977. p132. (3) Latour, Bruno. Politics of Nature: How to Bring the Sciences into Democracy. Translated by Catherine Porter. Cambridge: Harvard University Press, 2004. p25. (4) Bolt, Barbara. Art Beyond Representation: The Performative Power of the Image. London: I.B. Tauris, 2004. p82. (6) Berger, John. Ways of Seeing. Middlesex: Penguin Books Limited, 1972. p9. (7) Halsall, Francis. Systems of Art: Art, History and Systems Theory. Berlin: Peter Lang, 2008. p151. (8) Haraway, Donna J. When Species Meet. Vol. 3. Posthumanities. Minneapolis: University of Minnesota Press, 2008. p250. (9) Latour, Bruno. Politics of Nature: How to Bring the Sciences into Democracy. Translated by Catherine Porter. Cambridge: Harvard University Press, 2004. p224.